Whether you have a new dog that's still getting used to his surroundings or an overly-protective pup that responds to every noise they hear, it's good to get your dog's barking under control. Excessive barking can be a nightmare to deal with. Not only can it prevent you from enjoying your home, but it can annoy your neighbors when you're away. Dogs bark because it's the only way they can communicate. They often bark to ward off animals, express their needs, or simply because they're bored. If your dog's barking is starting to drive you crazy, you can invest in an anti-barking device. Originally designed to train hunting dogs, there are many modern options to help domesticated canines. They work to train your dog and corrective behavioral issues. There are a ton of products on the market, so it can be difficult to find one that works for your needs. Here's a list of some of the best anti-dog barking products that can help you stop the noise once and for all. Take your training on the go with this remote sound emitter from Doggie Don't. 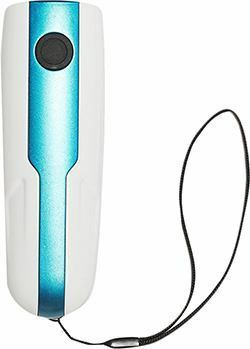 The handy device easily fits in the palm of your hand and includes a lanyard that can be wrapped around your wrist for easy access. With a press of a button, it produces a loud crackling sound that grabs your dog's attention. This sound is jarring. While it can also be heard by humans, you have the control to make it stop. The device is designed to be used alongside a strict training routine. It comes with an instructional manual that gives you tips on how you can stop excessive barking. From DogRook is this adjustable anti-bark collar. It uses vibrations and high-frequency tones to teach your dog. There are no electrical shocks at all. There are 7 different sensitivity levels so that you can find an option that works for your pooch. The device is small and unobtrusive. It's also water-resistant for added safety. The collar itself is made of durable nylon. It features reflective stitching for night time visibility and can be adjusted to fit the neck of any dog. This collar from PetSafe is designed for dogs weighing 8 pounds or more. It uses static shock technology to alert your dog when they bark. There are 6 different shock levels. It will start on the lowest setting and get progressively higher if your dog continues to bark. For added safety, there's an automatic shut-off function after 50 seconds. The device sits against your dog's neck and detects when they're barking by measuring vibrations. 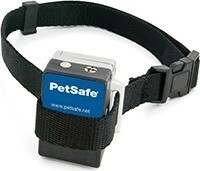 This helps to ensure that your dog won't get shocked just because a nearby pup is barking. If you're thinking about using a spray for negative reinforcement, this PetSafe collar is for you. It's a lightweight collar that's ideal for dogs that weigh 6 pounds or more. It uses a built-in microphone to determine when your dog is barking. When initiated, the collar will spray the included citronella mixture at their face. The collar itself holds enough liquid to spray up to 30 times. It comes with a large refill bottle that has enough liquid for up to 400 sprays. The entire collar is water-resistant for safety. This ultrasonic device from Super is designed to deter barking indoors and out. It's a standalone device that contains microphones. The microphones are capable of isolating the unique barking sound from up to 50 feet away. You can manually adjust the sensitivity of the device with a simple knob. When activated, it will emit an ultrasonic sound to silence your dogs. It's designed to look like a birdhouse so that you can place it anywhere. 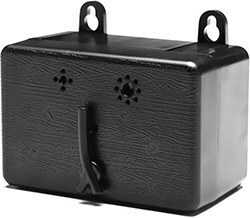 The emitter is made from durable plastic and is completely waterproof. This device is designed to blast an ultrasonic sound whenever barking is detected. It's completely safe to use and is an effective way to deter excessive barking inside or outside your home. The sound emitter is built to look like a stylish birdhouse. It can be hung on a tree branch or placed on a shelf. There are 3 range levels available. 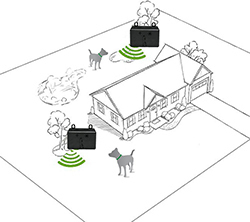 You can set it to detect barks from 15 feet, 30 feet, and 50 feet away. The loudspeaker has a 180-degree angle of projection, so your dog is sure to hear it. This Zelers bark deterrent product is made for dogs that are older than 6 months of age. 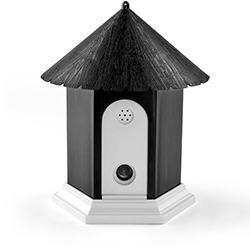 It's a remote sound emitter that can be placed outdoors. The device is built with high-quality plastic and is completely weatherproof. Microphones inside will detect barking from up to 25 feet away. It'll blast an ultrasonic tone to make it stop. It utilizes a 9-volt battery that is capable of lasting up to 6 months. With its built-in hanging brackets, you can easily mount this on a tree or wall. 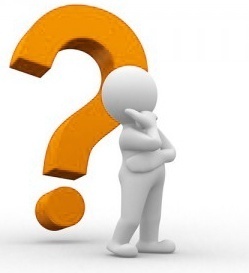 What Types of Dog Barking Products Are Available? There are a few different types of products that you can buy to help correct your dog's excessive barking. They all apply unique methods to deter barking. However, they all work under the same principle. They use negative reinforcement to teach your dog that barking too much is a bad thing. Anti-barking collars are equipped with a small device that produces an electrical shock whenever it detects a bark. They work very similarly to that of invisible fences. The device itself is relatively small so that it does not hinder your dog's movement. They also often contain two metal prongs that are designed to get through your pup's fur to make full contact with the skin. Shock collars have a bit of a controversial past. Older models produced a significant shock. These collars had higher level shocks that were very unpleasant for dogs. If misused, older collars did more harm than good. It would have the dog to get scared and often lead to more destructive behavior. However, modern collars are much better. The shock level is limited. Rather than hurting the dog, the static shock is more of a surprise that teaches them to improve their behavior. Sound emitters take advantage of the unique canine hearing system. Dogs are capable of hearing much higher frequencies than we humans can. Sound emitters will blast this higher frequency to catch your dog by surprise when he or she barks. The sound is not audible to humans but is definitely unpleasant for dogs. Like modern shock collars, sound emitters work within safe levels to ensure that your dog isn't harmed in the training process. There are two different types of sound emitters available. The first is a device that can be placed anywhere inside or outside the home. It uses sensors to detect when your dog barks and responds accordingly. The second is a collar. It's similar to a shock collar but replaces the shocking mechanism with a remote sound emitter. Both types of devices can be adjusted based on your dog's determination. If your dog continues to bark through the ultrasonic noise, some devices will increase the sound levels automatically. If you're worried about it being too much, don't fret. The measured sound level will still be safe for your dog's ears. You can take a more proactive approach to changing your dog's barking behavior. Sprays utilize a mixture of water and citronella. Dogs absolutely hate citronella. A quick spray to the face after they bark will give them all the negative reinforcement they need to learn. Sprays are available as standalone bottles or with collars. These collars work the same way as the two previous options. They detect when your dog barks. The difference is that the citronella mixture is located at the bottom of their neck. When your dog barks, the collar will automatically spray them. This is the question on every dog-owners mind. The goal of corrective behavioral training is to stop unwanted barking, not to hurt your dog. You'll be happy to know that most devices are completely safe. High-quality products have undergone a lot of testing to make sure. If you're in the market for one of these products, look out for proper certification and testing evidence. While some may view corrective training methods as inhumane, they're designed to grab your dog's attention, not harm them. While older devices were a lot harsher, modern options are designed with the animal's well-being in mind. They act as a nuisance rather than produce pain. With that being said, it's always a good idea to consult with your dog's vet before you decide to invest in a product. The methods may agitate certain health conditions. Do My Dog Need an Anti-Barking Device? Anti-barking devices are a solution to chronic barking. It can help dogs that bark for long periods of time or when it is not necessary. Dogs are going to bark regardless of how well they are trained. The occasional bark when a stranger approaches the door or when they see a squirrel running across your yard are not causes for concern. You don't want to teach your dog to stop barking altogether. This type of training is only designed to help keep excessive barking at bay. It's also important to note that these are training devices. They're not meant to be used 24 hours a day throughout their lives. You can start the training process by using the device when they start to bark the most. This could be when you leave the house for work or at night when they're alone in their crate. Eventually, your dog will start to learn and stop barking excessively. Once this happens, you should stop using these products and only bring them out as light reinforcement from time to time. If you're looking to invest in a product that can correct your dog's behavior, you have a lot of options to choose from. It's important that you take your time selecting the right product to ensure that it's safe and effective for your pooch. Always research a product before you buy it. The worst thing you can do is to pick the first item you see on a pet store shelf. Many times, these recommended products are not the best for your dog. Instead, they're from a company that has paid a lot of money for that extra advertising. Check out a product's reviews. 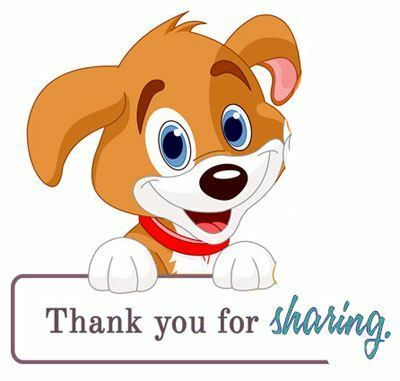 You can get a lot of information about how effective a device is by seeing what real dog owners have to say. You can learn a lot and get valuable tips on how to make the most out of your investment. Additionally, you should take a look at the manufacturer itself. Stick with reputable companies that have a history of providing high-quality pet products. Many products are certified for use with animals. They may have gone through rigorous testing to ensure that they're effective and safe. The best types of products to go with have been tested by a Certified Applied Animal Behaviorist. A device is only effective if your dog responds to it. Truth is, some dogs are more resilient than others. You may find that your dog ignores the warning signs completely and continues to bark. If that's the case, you're going to want to have something with multiple settings. The best option is a device that automatically changes its strength. As mentioned earlier, older devices were too strong for dogs and caused more harm than they should have. Unfortunately, those devices still exist. While they're largely ignored by the pet owner population, you can easily pick one up by mistake. Read the owner's manual and make sure that the power of these devices is limited to what's safe for dogs. You don't have to deal with excessive barking forever. There are plenty of tools available to correct this bad behavior. The right device will provide a gentle reminder that ultimately teaches your dog to stay quiet when they need to.